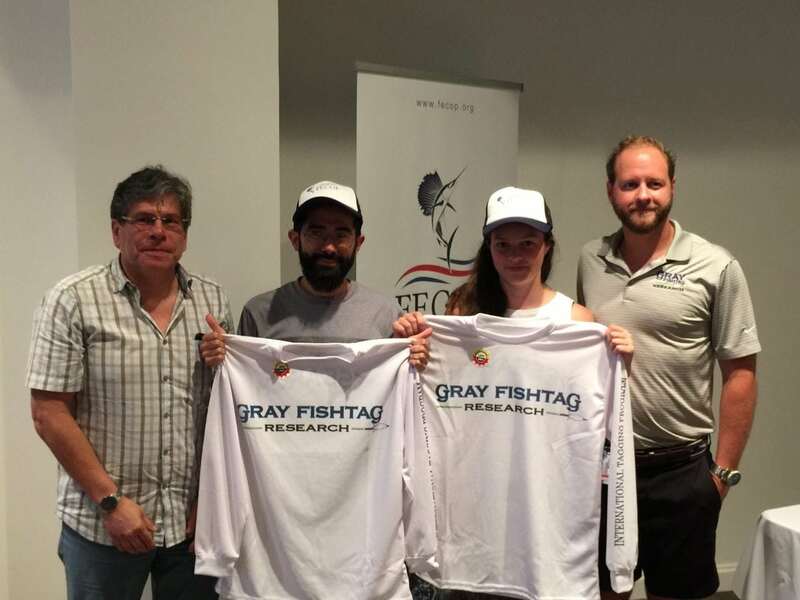 Gray FishTag Research (GFR) and The Costa Rican Fishing Federation (FECOP) collaborative alliance to strengthen the scientific research in the Costa Rican sport fisheries is now underway. The objective of this united initiative is to support the conservation and sound fishery management of sport-fishing resources in Costa Rica through the implementation of joint research projects and providing important data to the sport fishing sector and the fishing authority. The first collaborative effort, the support of complementary scientific research through a scholarship program was launched in August of 2016. Funds from FECOP was made available to support one undergraduate and two graduate students from the University of Costa Rica. The students received training about fish tagging and research by GFR and its lead scientist Mr. Travis Moore. The program is also supported by voluntary professional fishermen from the charter fleets. These professionals with their local knowledge and expertise are well committed and will provide access to the fish and ensure high rate of sample collection. Costa Rican vibrant sport fisheries are key to the country’s economy, providing thousands of jobs and generating social and economic development in coastal communities. Healthy and sustainable fisheries of a number of oceanic and coastal species are key to support the sport fishing economy. Scientific knowledge on the biology and ecology of fish species such as sailfish, marlins, tuna, mahi-mahi, rooster fish, snook, snappers and groupers among several others is essential to inform good fisheries management measures and improve resource conservation. Yet very little is scientific information on these species a situation that is challenging the conservation of the Costa Rican fisheries. These are the initial areas of collaboration between the two organizations. Tagging of sport fishing species in partnership with the charter boat fleet in Costa Rica and individual sport fishing boats utilizing the GFR model. Collaborative data analysis, report preparation including scientific publication of research results. Coordinated joint fundraising activities to provide the financial resources for the development of research projects. FECOP will support applications for scholarship grants on a yearly basis, depending on the scientific merit and of their research proposal. Students can apply for a full year or half year scholarship. Field research equipment and tools, including safety equipment and laboratory costs. Other fieldwork costs such as lodging, meals, transportation. Participation in scientific workshops, symposia, or technical & scientific training. Partial tuition (course registered for the project, e.g., independent study, thesis, etc.). Additional research areas may be considered depending on the merits and pertinence of the proposal. Proposed research need to be completed within the time of the duration of the research grant (six months or one year). What is Gray FishTag Research (GFR). How the GFR model works. How to engage and interact with anglers. How to work and coordinate with boat crews. How to determine a candidate for tagging. When to tag the fish. Where to tag the fish. How to record the data. How to handle the fish. Where to collect any samples. Proper techniques based on fish species. How to enter tag data. How to standardize biological sampling data with tagging data. Detailed training materials will be provided to the students. The students will also participate in simulated “on location” training. The hope and expectation of the program is also that it can continue to grow to where the areas of collaboration evolve other topics, and where specific research projects may be added as needed.